I bought this nozzle as a replacement for a previous no-name garden hose sprayer I bought from Lowes. The first one I had, which I call “Generic Unit One,” broke after the first drop. The head that let you switch the spray pattern broke in pieces. Very cheap! I thought this Viking nozzle would be the same since it is also inexpensive, but after reading multiple reviews online, I thought I should give the cheap garden hose sprayers another try, and I did. This one is under $6. I’m impressed by this Viking garden hose nozzle. The grip is very comfortable, the lever that allows you to spray without pressing is easier to use, and the sprayer has more spray patterns than the previous one had. I use this to water the plants, the lawn, and to also wash my car. It does not compromise the water pressure, so you get plenty of power from it. The jet spray pattern is very strong. it takes the dirt out of cracks in the concrete. Makes you feel like you are using a water pressure machine. I also used the shower pattern which is good to use to water the plants and to soak my car before washing. There are 8 patterns, including Angled, Flat, Center, Shower, Jet, Mist, Cone, and Fan. I think those patterns should be enough for almost any task that involves spray nozzles. I also think this nozzle is much more durable than the previous one I owned. I haven’t dropped it yet but you can tell by just touching it that it will last! It is heavy duty for sure, but with comfortable material. I had purchased two nozzles within a few months of each other. And within a few months of their purchase they both developed the same problem : the O-ring disintegrated. I am trying to get an address of the manufacturer to find out if they can send me some O-rings and also identify the size of the O-ring. I would not recommend purchase of this nozzle based on my experience. Very informative and well researched post. Your viewers will definitely love what you deliver. Keep it up bro! 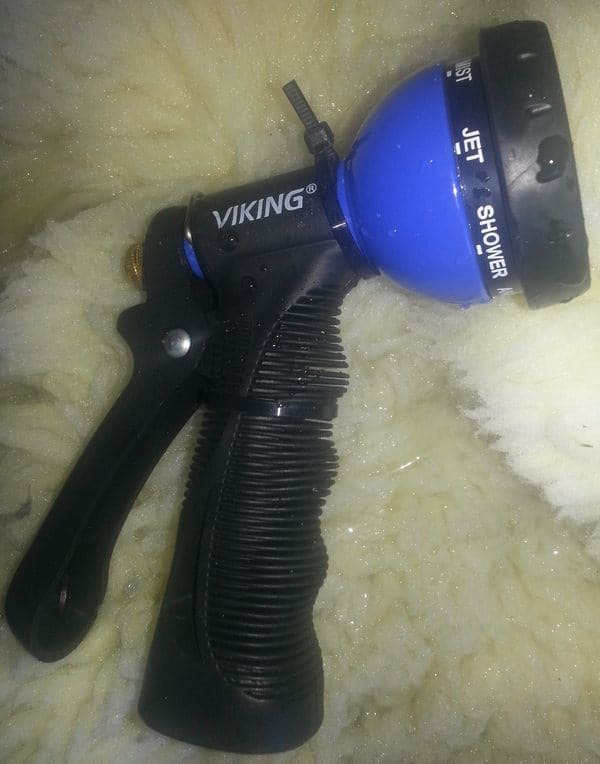 HAVE BLUE VIKING GARDEN HOSE NOZZLE THAT LEAKS AND WONT TURN OFF ITS THE ONE THAT TURNS TO ADJUST SPRAY NAD TURN OFF/ON PLEASE REPLACE OR HELP! UNIT LEAKS AND WON’T SHUT OFF TURNED NOZZLE BOTH LEFT AND RIGHT END TO END! PLEASE HELP! MALFUNCTIONING GARDEN HOSE NOT THE PISTOL GRIP!